Frandy Cuevas played for the Eastside High School baseball team for a year. His coach immediately recognized greatness. 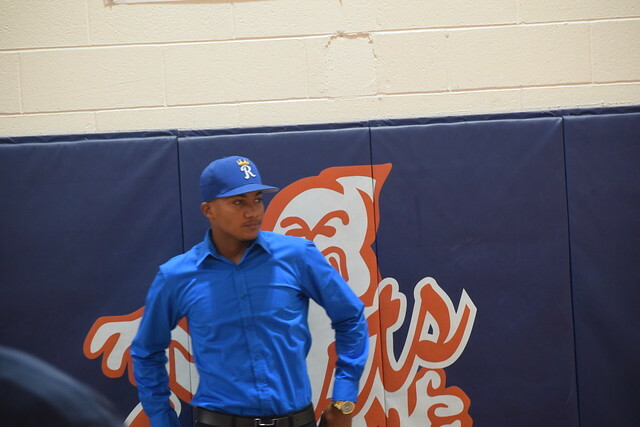 Cuevas, 17, has signed as a free agent with the Kansas City Royals. Next year, he will be in spring training, said the coach. Cuevas played for the Eastside High School team as a freshman. He was 14 at the time. Cuevas immigrated from the Dominican Republic. He spent 7th and 8th grades at School 11 before entering Eastside High School. Following his freshman year, he went on vacation to the Caribbean Island. His family took him to a baseball academy. “They saw he had potential and kept him there,” said Anthony Vasquez, who coaches students in Brazilian jiu-jitsu at Eastside High School. “Here, it’s a lot more difficult to sign,” said Cuevas via Vasquez. 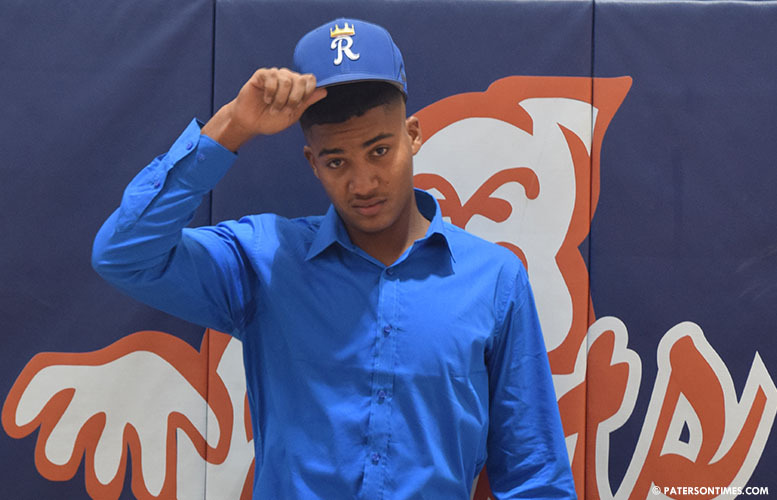 He signed with the Kansas City Royals from the Dominican Republic, he said. “My family felt really happy. All the effort that they put into me is now going to pay off,” said Cuevas, whose grandfather owns a league in the Dominican Republic. His father exposed him to baseball, he said. Eastside High School won three games with Cuevas on the team. The team won three games because of his pitching, said assistant baseball coach Jose Almonte. “He wasn’t much into pitching. He wanted to hit more because he’s a good hitter. We made him pitch for us,” said Almonte. Forcing Cuevas to pitch unlocked a dormant talent. Cuevas said the coaches were there when he needed them. Cuevas spends hours every day preparing for the professional league in his home country. He trains from 9 to 11 a.m. and spends an hour running in the afternoon, he said. Every six months, he has to travel from his home in Mao, Dominican Republic to the U.S. to keep his permanent residency. His father lives in Paterson, but mother has remained in the Dominican Republic. His two brothers attend Eastside High School. Both have signed up for the school’s baseball team. Cuevas often visits his old team at Eastside High School whenever he is in the U.S., said the coaches. He stopped at the school on Mar. 1 to speak to his coaches and a reporter. “It was really good experience,” said Cuevas of his time in the Eastside High School team. Perfect example of talent, hard work and understanding the game. He is a student of the game and also respects the game and the way he plays. We have so many talented players in the city of Paterson that can accomplish what Frandy did. We are looking forward to seeing him in the MLB over the next 4 to 5 years. Bravo. You make us all proud, young man. Wow, just to have your name call that you are selected is an honor. You are joining a very elite group , much success. You already look like a star. And I agree there so much talent here in this city. Eastside baseball program have been taking talented kids under Coach Rojas to the next level for years. From kids going to big competitive NCAA D1 programs, to Junior Colleges, and now this kid making it to the professional ranks. It has been very impressive watching from the outside how this program been have given inner city kids this so much needed guideness. Who is Anthony Vazquez and what does Brazilian Jujitsu has to do with anything on this article. I'm guessing he is the tiny fat guy on the pictures. Is he really in so much need for attention? I mean, look at him posing on the pictures. Why does he have to be the translator, the coach, and be in all of the pictures? Obviosly he is the joke of this article. He look like the only sport he ever played was beer pong, Jeez! I heard he even quit on the baseball team, but he can be there for the cameras of course. Buy him a donut and get him out of there!